Easter is a holiday that most young children enjoy very much. People celebrate the holiday with Easter egg hunts, good food and of course plenty of candy in the Easter baskets. Chocolate bunnies, colored Easter eggs, Peeps and small toys are always a must in everyone’s baskets. Today Easter is considered aChristian holiday, but most people don't realize that Easter also has roots in paganism. All the cute bunnies and eggs that are a part of the holiday symbolize spring and fertility. Whatever the origin and your belief system, the holiday is a good time to get together with your family. Even the White House celebrates the holiday with an Easter Egg rollon the South Lawn of the White House every year. The day is filled with fun games, stories and of course, the traditional Easter Egg roll. Wish someone a Happy Easter with this card! You can construct it in no time, and your friends will enjoy receiving your Easter wishes. Everyone appreciates a card that someone took the time and effort to make. It makes the holiday greeting extra special and you too will have a lot fun creating and giving this greeting card. One sheet white canvas texture cardstock for the card background. One sheet purple stripe card stock for the card background. Medium beige with brown dotted card stock for the bunny body. Cut one 4.75" x 4.75" square out of the white canvas texture background card stock. Glue purple spiral pattern ribbon with a glue runner to the bottom of the square as in the photo above. Using the ruler, determine the midpoint of the square and score horizontally with the bone folder. Run a glue edge with the glue runner on the back side of the white canvas texture square. Place the white canvas texture paper square on top of the purple striped card front making sure to have an even edge all along the white square. Press down firmly with your fingers to help the white canvas texture paper adhere to the top of the purple striped card front. Using the die cut files or pdf file if cutting by hand, cut the remaining card pieces as in the photo above. Apply glue to the bunny ear inserts. Apply to the bunny body and press firmly to set. Glue the paper flower centers onto the paper flower heads. Glue the grass into place using the glue stick on top of the purple spiral pattern ribbon. Use the above photo as a guide. Glue the Easter egg onto the bunny. Glue the bunny hands over the Easter egg. Glue the flowers onto the grass with the glue stick. 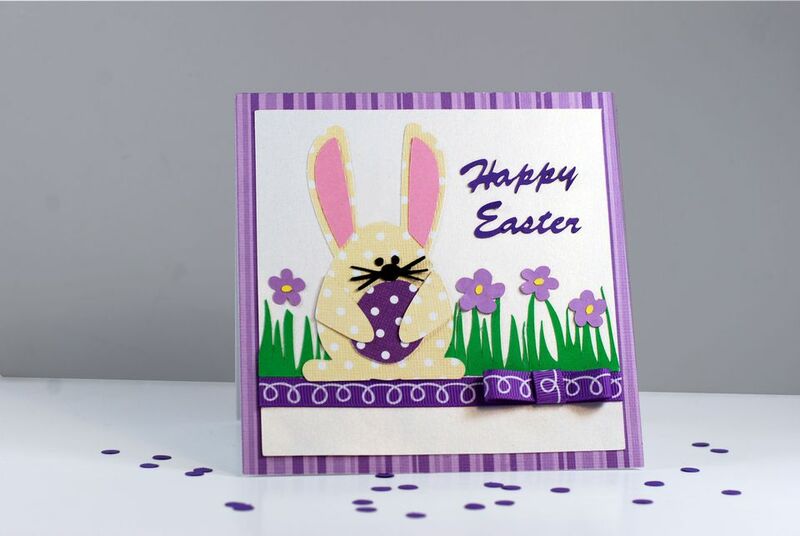 Glue the sentiment "Happy Easter"onto the upper right hand side of the card. Make a faux bow out of the purple spiral pattern ribbon and glue onto the purple spiral pattern ribbon. Your card is now finished! If you like, you can make a matching envelope, which will give your card an extra special look.